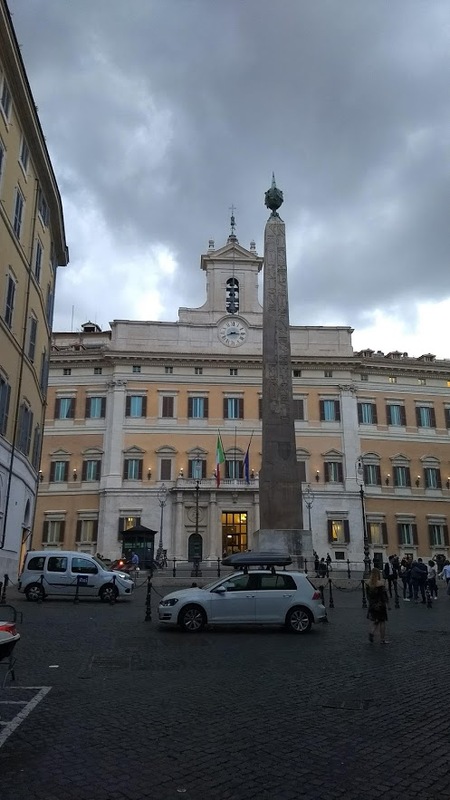 My wife, two youngest daughters, and I did a Rome walk on June 13, 2018, the late afternoon and evening we arrived in Rome, Italy. 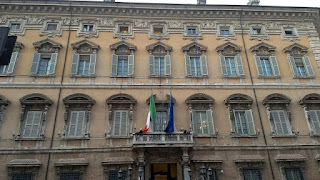 The idea was the heart of Rome walk of travel expert, Rick Steves. 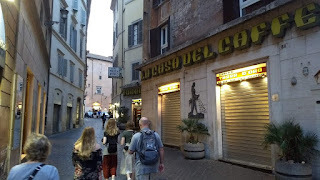 After eating supper, as I reported in our last post, we started at Campo de’ Fiori with the statue of Giordano Bruno, who died here, burnt at the stake. I would call Camp de' Fiori a trashy outdoor market. We were introduced here to street sellers we did not see in Venice. A big African-Italian man confronted us in a friendly way to tie little woven strings around our wrists as we said, "No, I don't want one." He smiled and kept tying the string, engaging in happy, broken English with a hint of violence. You would want him to stay happy, so you let him keep tying. He wants money. I gave him something worth the peacefulness. The fact that there are regular armed police and soldiers everywhere seems to avoid the worst of the hoi polloi. 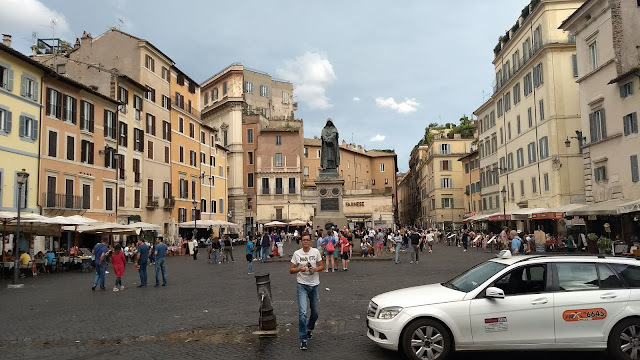 Lots of grungy looking people are sitting around all over, and especially all around the statue of Bruno, who Steves says represents the spirit of Campo de' Fiori. He died at the hands of Roman Catholicism for bucking the system. All those bucking the system gather there in happiness to be free thinkers. I would say its not going well for them. Steves says that at the spot of the building right to the left behind the statue (in the picture) is where Julius Caesar was killed, the site atop the ancient Theater of Pompey. 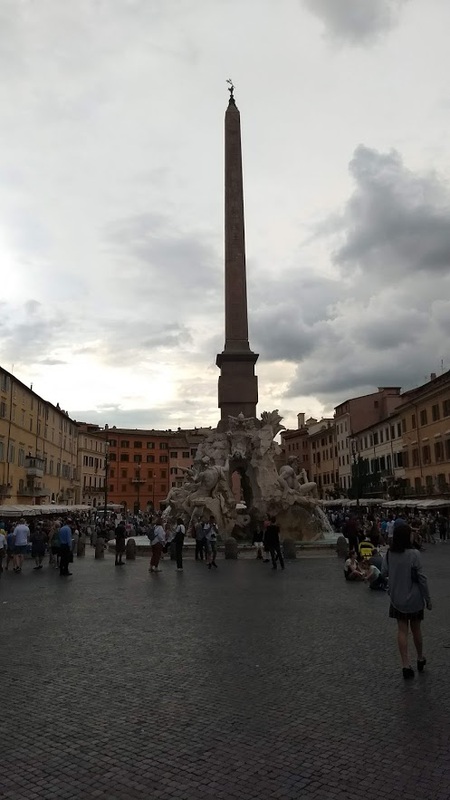 Next in the walk is Piazza Navona. 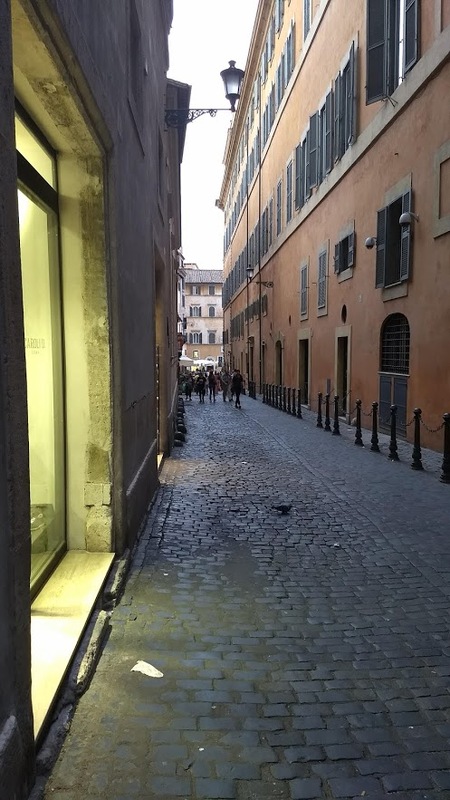 The streets are narrow leading there, something like those in Venice. What's amazing about this piazza is the three fountains and then the architecture of the buildings around the square, especially Sant'Agnese in Agone, the work of the Italian architect, Francesco Borromini. 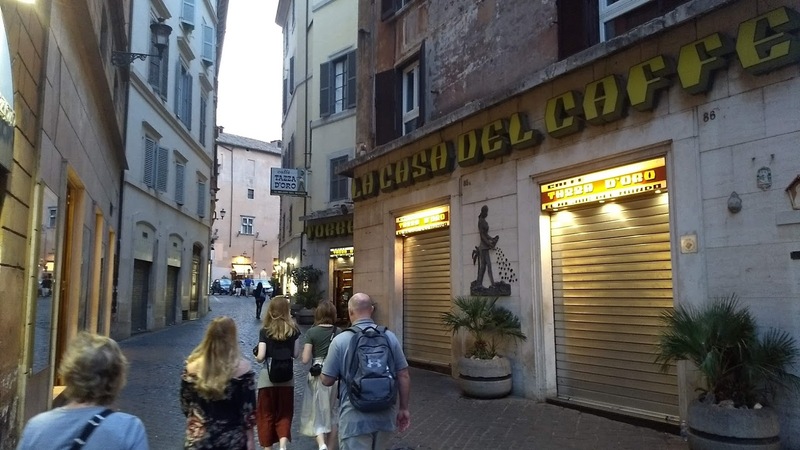 The Rick Steves walking tour includes an app for your phone that gives a description of the main points along the walk, and we paused at each fountain to listen to his explanations before moving on through the narrow walkways. 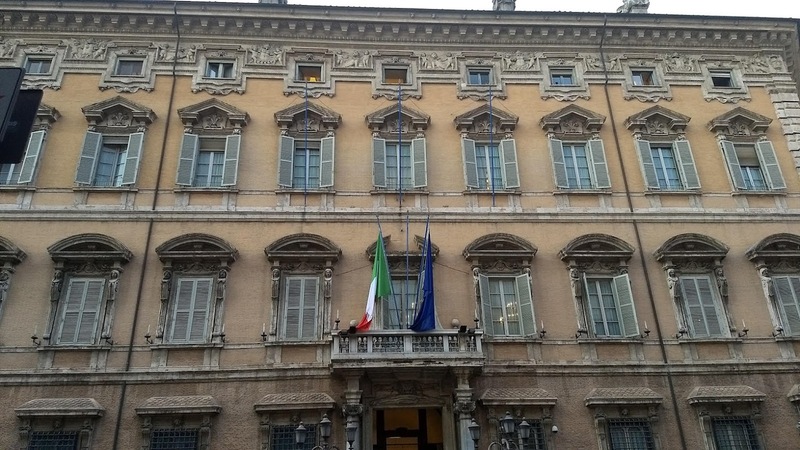 Along the route to the next major site is the actual Italian Senate building at the Palazzo Madama. 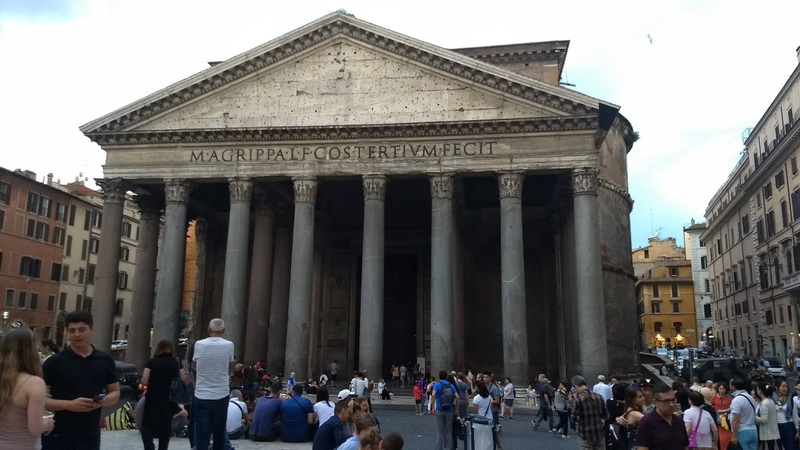 We stopped there long enough for a picture, but it is a site to behold as one turns the next corner, because there is one of the most astounding buildings in all of Rome, the Roman Pantheon, which was completed in 126AD. It was built as a temple to Roman gods and it stands right in the middle of the city as one of the best preserved pieces of ancient Rome. We couldn't go in that evening -- it was already closed -- but it was breathtaking from the outside. We went inside two days later, and I'll tell you about it then. Howard Schultz, who created Starbucks after a revelatory trip to Italy in 1983 convinced him that the Italian coffee cultured could be transplanted to Seattle. 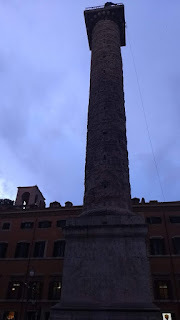 Colonna di Marco Aurelio. On the column is a relief that tells the story of Aurelius's successful Danubian wars. Once on the top was Aurelius, which was replaced by a statue of the Apostle Paul in 1589 after Christian saturation of Rome. 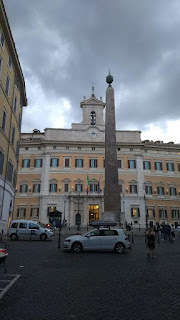 A lot of pagan Roman sites were Christianized after Roman Catholicism took over. We caught the bus home and saw the Colosseum at night, which they keep all lit up. It was spectacular. We hadn't seen the Colosseum yet, and it was so amazing that we weren't even sure it was the Colosseum. We would visit there the next day.